RedHouse ArtSpace is the virtual home of actor/composer/musician/visual artist Chris Humphrey. RedHouse is where she lives and works; Art is what she does. On these pages you will find her resumes and samples of her work, a marketplace for her choral music scores, and a repository of her free downloadable mummers plays. Enjoy your visit! Wassail is our annual Solstice/Christmas celebration at the Scottish Rite Theater, featuring live music, mummers, dancers, magic, puppets and more. There's a kid's show at 2:30 and the full evening show at 5:30. 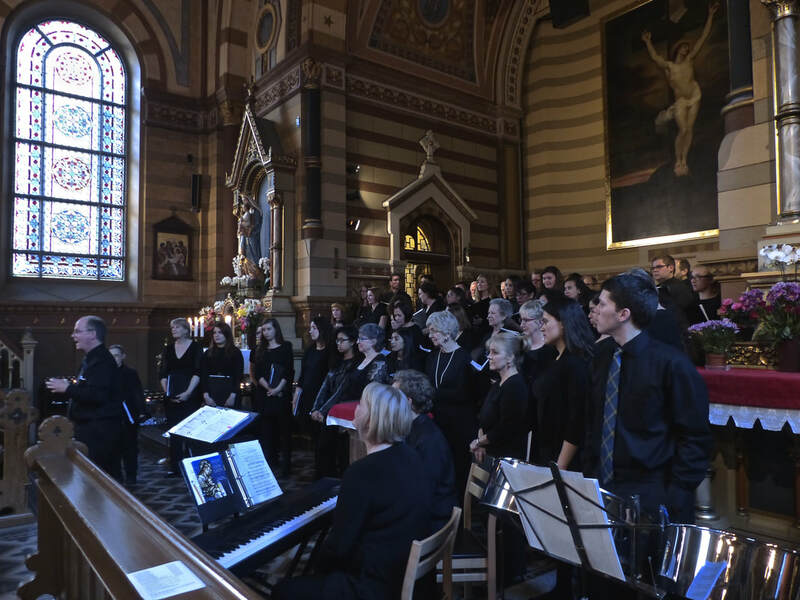 The St. Edwards Masterworks Singers included Chris's Ave Maria in their 2017 Scandinavian Tour repertoire. Click below to hear this recording from The Bergen Cathedral in Bergen, Norway. Chris takes to the sky as Lotharix LXIX in Sky Candy's production of Agent Andromeda: The Orion Crusade. The show was nominated for nine B Iden Payne awards and won five of them. ​The world premiere of Chris' 2015 choral composition Ave Maria will be performed by the St. Edwards University Chorale and Madrigal Singers at the university's annual Festival of Lights event on Friday, December 4. Once the piece has been performed, it will become available for purchase on this website. Chris is one of the featured aerialists in this month's Reporting Texas ​articles. Click here to enjoy the story by Faria Akram. Chris was nominated for a B Iden Payne Award for her sound design of Ashes, Ashes! At left is a group of actors from the show performing "Our Town" at the Awards Ceremony. Below is a selection of music from the show. Just in! Angelica, Women Chamber Singers have just sent a recording of The Mistletoe Carol which they performed in concert during the 2014 Christmas season. Enjoy it here, and be sure to look for it on their next CD. Visit the archives page to see earlier new items from RedHouse Arts.